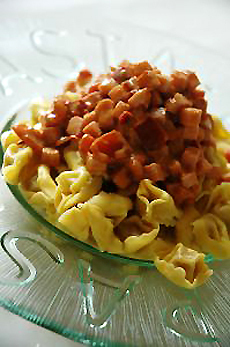 Tortellini, here with a tomato sauce and diced ham, is an elaborate rendition of a food that began as simple noodles, thousands of years ago. See the legendary inspiration for the shape. Photo by Nathalie Dulex | SXC. CAPSULE REPORT: This is Page 1 of a five-page article; here, an introduction to the history of pasta. Click on the black links below to visit other pages. Pasta is an ancient food—not so ancient that it predates written records, but no one was taking notes when this popular food first came onto the scene. Scholars credit the Chinese with making pasta from rice flour as early as 1700 B.C.E. The pasta-centric Italians believe pasta dates back to the ancient Etruscans, who inhabited the Etruria region of Italy (the central western portion of Italy, what now are Tuscany, Latium and Umbria) from the Iron Age into Roman times (from the 11th century B.C.E. to the 1st century B.C.E.). Around 400 B.C.E., they began to prepare a lasagna-type noodle made of spelt. The Romans who followed made lagane, a kind of lasagna, from a dough of water and flour. However, both the Etruscans and the Romans baked their noodles in an oven, so boiled pasta had yet to be born in Italy. The dried noodle-like product they brought with them could easily be reconstituted into a hot, nutritious meal. This is most likely the origin of the dried pasta that began to be produced in great quantities in Palermo at this time. The word “macarone” derives from the Sicilian term for making dough forcefully; early pasta-making was a labor-intensive, day-long process (more about that in a few paragraphs). 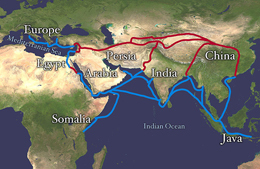 The Silk Road or Silk Route was an interconnected series of routes spanning 5,000 miles through Southern Asia, traversed by caravan and ocean vessel, connecting Chang’an (today's Xi’an), China with Antioch (in today’s Turkey) as well as other points. The term is a translation from the German Seidenstrasse, bestowed by German geographer Ferdinand von Richthofen in 1877. Photo courtesy NASA | Goddard Space Center. How the pasta was eaten is not known, but many old Sicilian pasta recipes still include other Arab culinary introductions such as raisins and cinnamon. The oldest macaroni recipes in existence are from Sicily and still part of today’s cuisine: macaroni with eggplant (eggplant was introduced by the Arabs in Sicily around the year 1000, via India) and macaroni with sardines. What the Italians most likely did add is sauced pasta. ²There were repeated invasions between 827 and 965 C.E., with the fall of Palermo in 831 and the fall of Siracusa in 878.